Quotes to live by, we all have them. Sometimes the simplest quote is a comfort or a reminder that helps us get through life. “This, too, shall pass” is a good example that’s gotten me through (too many) hurricanes. The Serenity Prayer is another tried-and true, to help us with perspective when times are challenging.Because this is a (sometimes, heh) style blog, let’s look at some style quotes that can help us get dressed authentically. I’d love to hear any of your favorites in the comments. Stunner. Image from this site. “I loathe narcissism. But I approve of vanity.” – Diana Vreeland. This is a spot-on quote about the difference. Vanity, applied judiciously, is beneficial for putting our best selves forward. Narcissism is ugly. 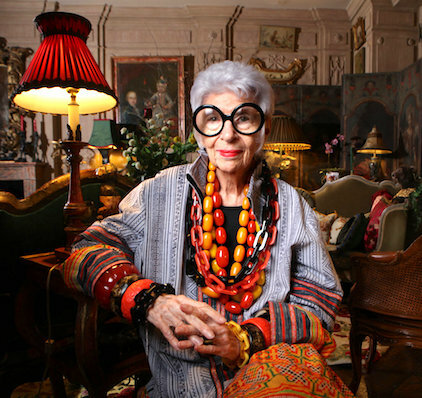 “Fashion you can buy, but style you possess. . . . It’s about self expression and, above all, attitude.” – Iris Apfel. I love the emphasis on attitude, which I think is the only “secret” to looking fabulous. She has attitude for miles. Photo source. “Don’t be into trends. Don’t make fashion own you, but you decide what you are.” – Gianni Versace. Well, I was crazy about Mr. Versace, his talent and his kind soul. His advice about trends is totally relevant in every era. Trends come and go, and in a few decades, they come back! “I have always believed that fashion was not only to make women more beautiful, but also to . 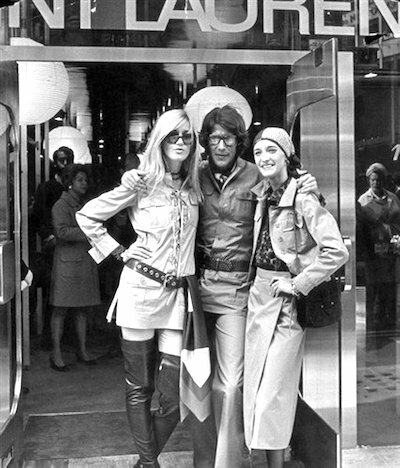 . . give them confidence.” – Yves Saint Laurent. Preach it, YSL. Confidence and attitude, that’s what we’re talking about. His 1970’s designs don’t look dated to me. Photo source. “Conformity is the only real fashion crime. To not dress like yourself and to sublimate your spirit to some kind of group identity is succumbing to fashion fascism.” – Simon Doonan. I’ve read his style books, and he’s a witty commentator. I agree that the “group identity” suffocates personal style. “The fashionable woman wears clothes. The clothes don’t wear her.” – Mary Quant. Loved her for the miniskirt revolution, and she’s right about this – don’t be out-shone by your out-fit. She was one of my idols when I was 12! Photo source. “What you wear is how you present yourself to the world . . . Fashion is instant language.” – Miuccia Prada. Communication is visual as well as verbal. Let your outfits speak from the heart. Wearing Valentino at her movie premiere: “A Star Is Born.” Photo source. Please be aware that links to vendors may be affiliate links. I may benefit from your purchases through the links on the blog. Your posts are really so loveable Patti. You connect fashion with living both metaphorically as well as frankly. Though I seldom comment, I appreciate your thoughtful writing more than the fashion…Then you remind me of their interdependent nature. They are all fabulous comments, thank you. Most of all I agree with Iris Apfel about attitude. It changes everything! Love reading your posts. Truer and more inspirational words were never said. While I admire the chutzpah and joie de vivre of someone like Anna Della Russo, who is like a performance artist using fashion as her medium, my own tastes lean more toward Carolina Herrera (white shirt with a skirt that has pockets) or the menswear-inspired looks of Inès de la Fressange.